Contents. List of Contributors. Introduction (J.E. Hesketh and I.F. Pryme). Red Cell Cytoskeletal Abnormalities (J.E. Barker). Dynamic Modulations and Functional Importance of the Actin Network in Human Neutrophils (T. Andersson, M. Fällman, C. Hellberg, R. Löfgren, J. Ng-Sikorksi, A. Sjölander, and E. Särndahl). The Hepatocyte Cytoskeleton: Biochemical, Physiological, and Pathological Aspects (L. Agius). Defects in Muscle-Cytoskeleton Interaction in Diseased States (E. Ozawa and A. Suzuki). The Cytoskeleton and Neoplastic Transformation (S. Kellie). Intermediate Filament Proteins in the Inner Ear (W. Kuijpers and F.C.S. Ramaekers). The Neuronal Cytoskeleton M.S. Bush, P.A.M. Eagles, and PR. Gordon-Weeks). The Cytoskeleton in the Biology of Bone Cells (A. Lomri and P.J. Marie). Antibodies to Keratin and Associated Intermediate Filaments in Rheumatoid Arthritis and Other Connective Tissue Diseases (D.L. Scott and P. Kurki). The Cytoskeleton and Virus Infection (D.G. Macejak and R.B. Luftig). Regulation of Cell Morphology and Growth by Syndecan-1: Altered Expression in Malignancy (P. Inki and M. Jalkanen). The Sperm Cytoskeleton and its Defects (B.A. Afzelius). The Cytoskeleton of the Intestinal Epithelium: components, Assembly, and Dynamic Rearrangements (W.M. Bement and M.S. Mooseker). The Plant Cytoskeleton (E. Davies, B.D. Fillingham, and S. Abe). Plasma Membrane-Cytoskeleton Complex in the Normal and Cataractous Lens (E.L. Benedetti, I. Dunia, J.L. Dufier, Y.K. Seng, and H. Bloemendal). Index. 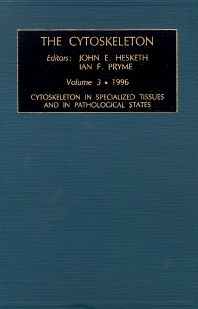 This volume deals with aspects of the cytoskeleton in different cell types and also describe examples of changes in the cytoskeleton which occur during various pathological states. These studies bring the exciting area of cytoskeleton research into the domain of medical science.